James Calderhead attended George Heriot’s School from 1901 – 1908. He worked as a clerk in the office of the Granton Timber Company. 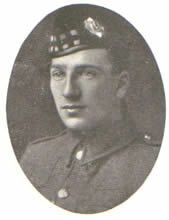 December 1914, he was a private in the 16th Royal Scots; Corporal in France, Janurary 1916. He was killed in action on 1st July 1916. He was the younger son of Mrs Calderhead, 13 Springvalley Terrace, late of 19 Shandon Street. His name is on the St Michael’s WW1 memorial.